Once the language is set, the story is ready, and everyone is on the same page – the show starts. It’s a long rollercoaster of between 4-6 months, but Matoki has a proven and structured process in place for it. Note – even if the company is fundable, it should still plan it’s funding using a structured, robust, and proven process. In order to join forces, Matoki becomes part of the team as interim CFO, focusing on funding, but also supporting the company’s on-going finance operations activities. Matoki’s selective approach and the confidence the local and global investor network has in Matoki, provides clients with an immediate benefit. 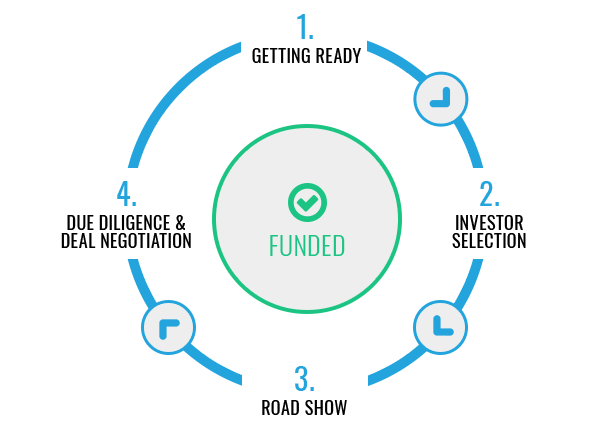 Matoki’s comprehensive access to funding markets such as VCs, Angels, and banks, offers a significant catalyst to the funding process. A CEO has to remember that a road show is time consuming, and he/she cannot afford to stay away from on-going business activities. Therefore, the key word is: smart and careful investor selection. Thus, it is not recommended to meet each and every VC or angel in the market. Matoki will not only identify the right VC or angel, but more importantly – identify the right contact person within that VC, whom Matoki knows personally. Remember – that person will hopefully be a future board member, and therefore, good chemistry is important. Usually the initial selection brings 3-4 main funding candidates that will result in further meetings. Matoki will take an active role in the investor roadshow that it organizes. In those meetings Matoki joins the CEO as the interim-CFO and of course understands your business plan “inside-out”. Since Matoki was the one who prepared it, he will be ready to answer, in straight talk investor language, any question about the business model. Remember – the purpose of the 1st meeting is to spark curiosity and get an invitation to the 2nd one. After each meeting, a “lessons learned” session will be held. If required – the presentation will be adjusted and in some extreme cases, even the business model will be revised. This will sharpen our internal understanding and improve our performance for the next meeting. Matoki will be the “go-to-guy”, for any questions on the investors’ side. Matoki’s experience should ensure that the due diligence stage will be very effective and efficient. Once a term sheet is submitted, Matoki helps in reviewing it, highlighting pros & cons. This may be the CEO’s first time at the investor table, but it’s not Matoki’s. Red lines and compromise outlines are defined, in preparation discussions between the CEO and Matoki before commencing with deal negotiations. Topics such as valuation, dilution, voting rights, impacts on next round, stock options pool, cap table, etc., are discussed internally prior to final negotiation. Matoki participates in all deal negotiations until close. Mission accomplished – Money in the bank!